Building heights in the Diridon Station area are currently limited due to the proximity of Mineta San Jose International Airport and its flight paths. Photo by Sergio Ruiz for SPUR. Today the area around San Jose’s Diridon Station is a 240-acre swath of surface parking and underutilized land, but within 10 years the rail station will offer unparalleled transit connections to the region and the state, including BART, Caltrain, high-speed rail and VTA light rail. The decisions that we make about what to do with the surrounding area will determine how successful the transit will be (i.e., how many riders use it). And the infrastructure, buildings, streets and public spaces developed there will outlast all of us. This is the most important city-building opportunity San Jose will get for a long, long time. But unfortunately, Diridon Station and the area surrounding it face a unique challenge: the proximity of the Mineta San Jose International Airport and its flight paths limits how tall buildings in the area can be. Why does building height matter? One of SPUR’s priorities for this area is to maximize the amount of jobs and housing within walking distance of the station. This will help connect lots of residents and workers to high-quality transit and help to alleviate the congestion of workers flowing north by creating a regional job center for the South Bay. As a high-speed rail station, the Diridon area is a project of statewide significance. And with Google’s purchase of at least 21 parcels in the station area for a new village-style campus, it has the potential to garner global visibility. Google is hoping to build a lot more in the station area than is planned — more like 8 million square feet. This would benefit the community because more growth in the station area means more transit riders, as well as more property taxes and sales taxes for San Jose, the county, local schools and special districts. In the past, the growth of air travel was viewed as a paramount concern for the growth of cities and their economies. Today it’s clear that both air and rail service are vitally important for economic development, enhanced mobility and the resilience of our region. We want both the airport and the greater downtown (including Diridon) to be successful and maximize the investments we are making in new rail systems. All of these factors raise a important question: Is there a way to increase building heights at Diridon without affecting the needs of the airport, its airlines and their passengers? How do flight paths limit building height in the Diridon Station area? The Federal Aviation Authority (FAA) requires that when airplanes take off, they must be able to clear any obstacles in their path, including buildings. This must remain true even if one engine should fail, giving a plane less power with which to climb over those obstacles. This condition is referred to as “one engine inoperative” or OEI. While it’s not a common occurrence, the federal mandate (known as the Terminal Instrument Procedure) affects all airports and limits building heights near them. Because Diridon Station is located directly south of the airport’s runways, most of the development in the area surrounding the station is zoned for about 12 stories — and only 10 stories in the areas closest to the station. Building heights are zoned for about 10 stories (110 feet) in the core of the station area. This limits the number of people who can work and live in the station area. Courtesy City of San Jose Diridon Station Area Plan (2014). To comply with the federal requirement, each airline adopts its own practices. Aircraft fly on predetermined pathways known as “surfaces.” There are usually multiple surfaces over every airport and in its vicinity, often at different heights. The surface that the FAA requires for safety reasons is actually not one of the lowest surfaces; often airlines choose a lower surface based on operational and economic factors, such as the type and age of their fleet of airplanes and the mix of cargo, passengers and fuel. Could we adjust flight paths to allow for more jobs and housing at Diridon? While the FAA surface is required for safety reasons, it is operational and economic factors that drive airlines to fly at even lower surfaces.This means it may in fact be possible to change flight paths in order to allow the area around the station to become a taller and more dense urban center. 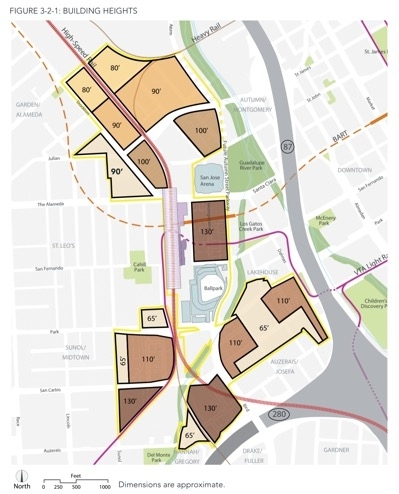 To find out just how much more development San Jose could potentially get in the station area, SPUR engaged Skidmore, Owings and Merrill, LLC to analyze growth capacity on vacant and underutilized land in the Diridon area. SPUR and SOM’s analysis shows that San Jose could get almost a 40 percent increase over what’s planned just by building up to the FAA-mandated surface rather than the airlines’ preferred surface. We identified two separate estimates for how much development capacity could be gained if the flight paths over Diridon Station were adjusted and buildings heights could be increased to the FAA surface. 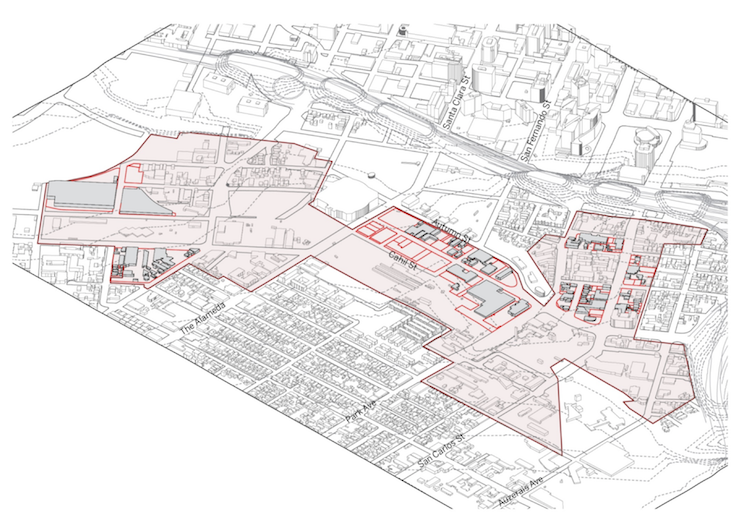 SPUR and SOM identified vacant sites and parking lots in the Diridon Station area (outlined in red). The sites currently used by the SAP Arena for parking are excluded. Rendering by SOM. 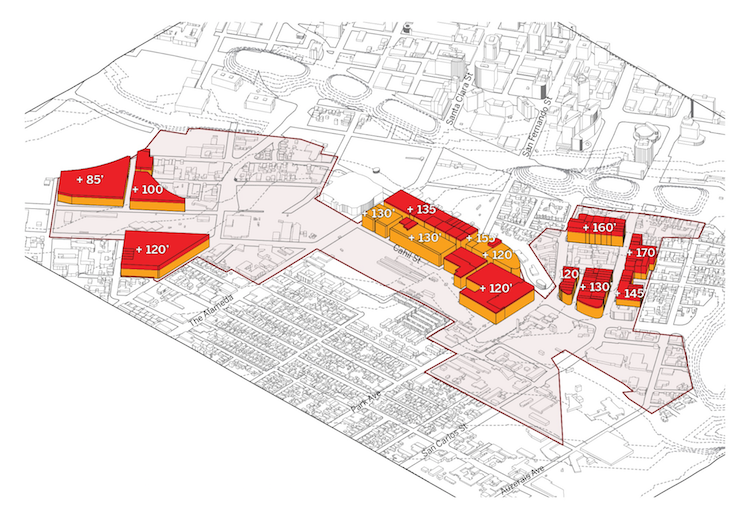 Our first estimate analyzed parcels that are currently vacant or used as parking lots. We estimate that San Jose could gain 1.2 million more square feet of development capacity on these sites if the future buildings were developed up to the FAA surface. This resulted in a 23 percent increase over the amount of development capacity currently permitted in the Diridon Station Area Plan, which could equate to approximately 4,800 additional jobs in the station area. The station area could gain an additional 1.2 million square feet of developable space if underutilized land was redeveloped up to the FAA surface. Our second estimate looked at how much development capacity could be gained from redeveloping underutilized sites with one to two stories of existing commercial or industrial uses up to the height of the current FAA surface. We estimate that developing these sites could add more than 1.1 million square feet of development capacity to the overall footprint of the station area, bringing the total development capacity of both scenarios to 2.3 million more square feet — almost a 40 percent increase over what’s planned. These estimates are relatively conservative and this analysis is not meant to be exhaustive. For example, we did not assume that developers would get permission from the FAA to exceed the FAA surface (although it is sometimes possible to do so). We also did not assume that development would occur over the railyard itself. Additionally, we excluded from our analysis the two parking lots used by the SAP Arena. 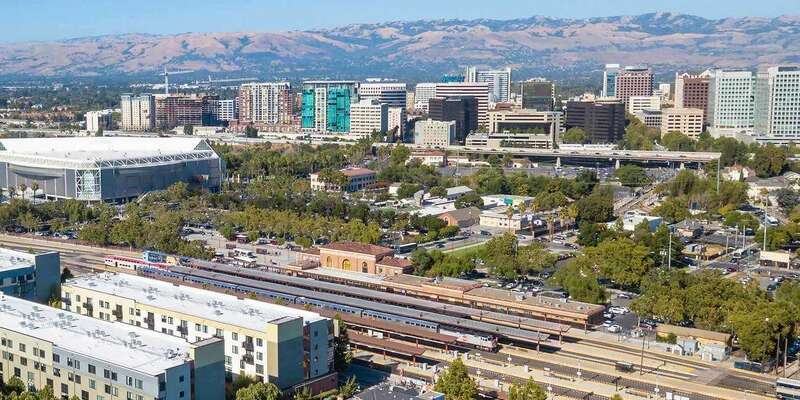 If new development in the Diridon Station area embraces an urban approach and supports public life, it could foster a renaissance of civic life, identity, economic activity and green urban living in San Jose. With so much potential, it’s imperative that a more in-depth analysis be conducted prior to new development moving forward. Are there other ways to get the same amount of development capacity in the station area with a different plan, reduced parking or different building types? How might changing the flight paths impact the competitiveness of Mineta San Jose International Airport for new flight service? How much revenue might be gained for needed public improvements through value capture mechanisms on additional square footage, as well as increases in property taxes and sales taxes? The questions about San Jose’s skyline height have long been discussed and challenged by civic groups such as the San Jose Downtown Association and the Silicon Valley Organization. With this analysis, SPUR and SOM have added data that further calls into question the current limitations. As a result, the City of San Jose has launched an investigation of the possibility for increased heights in the station area. We look forward to the results of the city’s research and how it might further efforts to realize the significant opportunity at San Jose’s central station and greater downtown. Special thanks to Kenichiro Suzuki, associate at Skidmore, Owings and Merrill, LLC, for helping SPUR answer critical questions about how to make the most of remaking Diridon Station and the station area.